Should You Be Running After Drinking Alcohol? | A Guide To Running Better! HomeRunning TipsShould You Be Running After Drinking Alcohol? It was your friends birthday and you had a few drinks. Or it was your uncle’s wedding and you had a few more drinks than you should of… but you want to exercise off the alcohol and not suffer the consequences of a few extra calories and weight gain. When you drink alcohol, it affects your ability to concentrate and think. So, if you plan to run straight after you had some alcohol, then it would not be a good idea. When you run, you won’t be able to properly coordinate your steps and you may risk falling over and injuring yourself. Also, there is even more risk if you try to exercise in an urban area as there are cars, roads, and buildings that could be hazardous and dangerous to yourself. When should you run after drinking alcohol? Well, this depends on the individual (as we all handle alcohol differently) but a general rule of thumb is to run when you are sober. You feel sober when you are fully able to think clearly and walk in a straight line. Now, exercising when you have a hangover can be still achieved. More on that later in the article. If your running plan consists of you running/exercising in the morning, then you will need to see how you feel when you wake up. If you still feel dizzy, then don’t go on a run. Wait until later that evening and see if you are still able to run then. Running in the evening after drinking the night before sounds like more of a better choice in general. You are more likely to be sober than you were in the morning. Again, make sure you are soberer than you once were. Choosing when to run is possibly the most important decision you must make. The longer after your drinking, the better. What happens if I do decide to run after drinking? When consuming alcohol your body changes and reacts differently. Your brain and body get affected in many ways. Running when you are under the influence of alcohol can cause your body to exhaust more your resources such as your energy, hydration, and coordination. Alcohol is known as a diuretic and this leads to the production of urine. When you start to sweat from your runs, your kidneys will also be increasing how fast it works making you even more dehydrated. So, expect to go to the toilet more often. Or more visits to the bush (if you are a gentleman). You will also be making your running less efficient as you will be making more stops. When running sober, your heart (as expected) raises it’s beats per second when you do any form of exercise. You rely on your heart to pump blood to your muscles to feed them glucose and oxygen for energy. Alcohol, on the other hand, interrupts the process in how your body works. For example, the alcohol in your body dilutes your blood cells and extracts blood from your muscles. Essentially, your body and alcohol are competing for the “fuel” which is known as glucose which impairs your ability to perform at your normal ability. Should I run before a race after having alcohol? You may be celebrating or “preparing” for your race by chugging down pre-marathon drinks to perk yourself up! But, you may have to consider if drinking alcohol beforehand is a good idea. In hindsight, no. The preparation needed before a race is crucial to not injure yourself and perform at your best. To drink alcohol and spoil any preparation you have put in beforehand, is literally a bad choice and not anyone would want to ruin their hard work. Now, if you are not intending to compete for the fastest times but to enjoy the race by running with your peers, a small amount of alcohol won’t cause too many problems. But, keep in mind how much alcohol is in the drinks. Marathon, half-marathons, 10k runs etc… are designed to test one’s ability over a long distance. You cannot expect to perform at your best even if you had one drink of alcohol as it affects one’s ability to keep there head screwed on and focused. 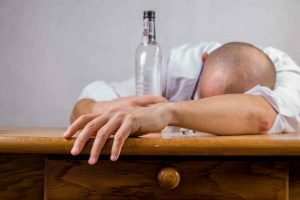 Is it a good idea to run if I have a hangover? When you wake up, you are faced with a massive headache (most likely from the heavy drinking session the night before) and running with a headache, isn’t the first thing everyone wakes up with. There is no reason why you couldn’t. Running with a hangover could actually reduce the intensity of a headache as getting fresh air and doing gentle exercise is a great way to clear your mind. Running will not make it disappear entirely, but a mixture of fresh air, hydration and low to medium intense exercise can help you recover quicker. Of course, the amount of alcohol consumed plays a role. If you are paralytic, then it is best to not run at all! If you are a regular consumer of alcohol, there are other “side-effects” that affect your body. One example is, alcohol causes you to gain weight as there are lots of calories in alcohol – which is possibly why runners want to run soon after they have had some drinks to prevent gaining additional weight. Alcohol causes you to gain weight. 1g of Alcohol is worth 7 calories! Alcohol is usually referred to as “empty calories” as they have no use. 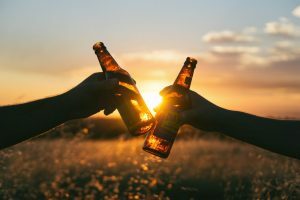 If you are running to lose weight in general and struggling to see results based on your efforts, then alcohol is probably the reason why you are not losing weight. Cut down and regulate the amount of alcohol you consume. If you are an avid body-builder or building muscle, then alcohol can stunt one’s ability to grow muscle. Alcohol affects how we sleep and in order to grow muscle, growth hormones (we need these to grow muscles) are released during while you sleep. Alcohol causes you to have irregular sleep patterns, wake up in the middle of the night and causes you to crave more food. If you have ever suffered from an injury from running in the past, expect the recovery time of your injury to increase when you have alcohol. Alcohol causes your blood cells in your body to open up. This means an increased amount of blood in all areas of your body resulting in longer bleeds and swelling on injuries. This is actually one of the most concerning risks. Up to two days after alcohol heavy consumption with exercise is the window of concern. Whilst your heart raises when doing exercise, a mixture of alcohol is likely to further stress your heart with irregular heart rhythms and patterns. If you are planning to do high-intensity cardio after a heavy session out with your friends, avoid doing at all costs. It’s better to be safe than sorry! If alcohol gets in the way of your running goals, managing how much alcohol you drink can benefit you instantly! I get it! Alcohol can be hard to get away from if you are a responsible drinker. It’s great to have when you’re in parties, occasions, and special events. The use of alcohol helps bond us together in many ways. But, if alcohol interferes with your fitness goals then you will need to plan everytime you drink. One example is to plan when to have alcohol. If the weekends are the times when you drink the most alcohol, allocate the mornings of the days you to drink to get it done and out of the way with. Eating food when exercising can suppress the amount of alcohol you drink and the effect it has on your body. Carbohydrate-rich foods, especially, help you replenish muscle food stores also. If you cannot amuse yourself with your friends or by yourself without having alcohol, then you will need to come up with some new things to do. You could join a local sports team around one of your favorite sports. Such sports like football, soccer, pool, and table-tennis could be options to consider.